Nowhere is the West Coast vibe more apparent than on the region's stunning beaches, bays and lakes. You can bring this unique vibe into your home or office with one of our striking West Coast nautical wood charts. Featuring fine craftsmanship alongside accurate geographic details, these maps are truly West Coast art at its finest. Each of these gorgeous 3D West Coast nautical charts for sale are carefully carved to show nautical features. Order your West Coast Waterways Chart today, or contact us if you have any questions for friendly and knowledgeable customer service. Trace the California coastline with our Los Angeles to San Diego coastline map or soak in the romantic depths with our Lake Tahoe 3D map wood art. Here you'll find charts that feature coastlines, inlets, bays and lakes from Alaska all the way to the tip of Baja. Beautiful artistry and accurate details combine to make each West Coast topographic map a conversation piece. 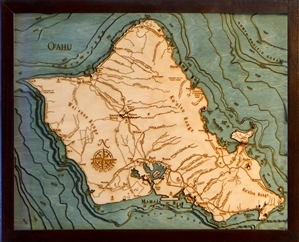 Get the best carved wood West Coast nautical charts for sale from Carved Lake Art. "The wall hanging arrived on time and it exceeded my expectations in every way. It is a very beautiful and interesting wall hanging-- I ordered the Salish Sea map. It is well worth the cost, and I highly recommend it to anyone considering purchase." Barbara D, Washington State.